By that headline, we are referring to tires and healthy practices, of course. A large tire retailer once had the slogan ‘tires ain’t pretty.’ This clearly doesn’t apply to how most car enthusiasts feel about the tires on their ride. Whether you’re running a large/small combination, have painstakingly located original-style reproduction tires, or cringe if your raised white letters or wide-whitewalls get too close to a curb, your tires matter. What isn’t pretty is what happens to a tire as it ages. Usually unseen, the compounds holding it together break down, which can lead to separation and blowouts. Most tire manufacturers currently only warrant their products for defects from between five to seven years. Six years seem to be the general consensus. Most steel-belted radial tires have an inner liner, two polyester body plies, two steel belts, two bead-reinforcing strips, the sidewall rubber, and tread. These are assembled in an uncured state and then vulcanized. It is a process where the assembled, uncured tire is subjected to high heat and pressure. This causes the components to bind together into a completed tire. Fortunately, tires produced in any recent time period have their production dates branded into the sidewall, close to the bead. 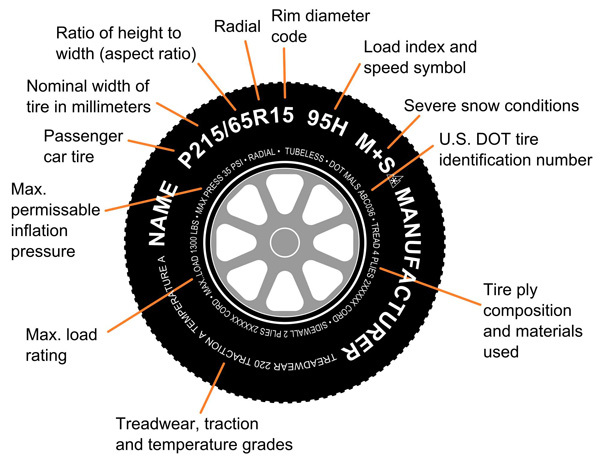 Starting in the year 2000, the week and year the tire was manufactured has been identified by the last four digits of the Tire Identification Number. There are 2 digits being used to identify the week, immediately followed by 2 digits used to identify the year. 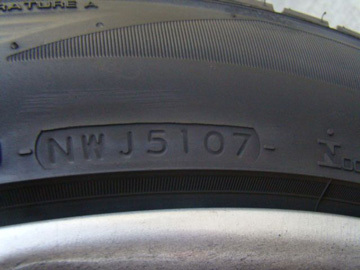 If you found a tire branded NWJ5107, the last four digits would represent the 51st week in 2007. This tire is too old to safely use! The connection to our hobby is clear. Most collectors care for their vehicles by giving them garage space and keeping them clean. Whitewalls, redlines, and raised white letters are kept bright, and much time is spent keeping the black areas clean and shiny. Six years go by very quickly with a limited use of vehicle you love. Trailers, tow vehicles, motorcycles, and RVs are also frequently riding around on tires that are beyond their safe age. If you are considering purchasing a limited use vehicle, a good question to ask is how old the tires are. If they are near or over six years old, you will want to budget for their replacements and you likely wouldn’t want to try to drive the vehicle home. No one wants to experience tire failure! So where does this leave us? The expense of replacing tires every so often needs to be a consideration in the cost of owning a limited use vehicle. You will likely need to replace them significantly before the tread is worn out, so why not enjoy the time you have with them? Maybe you have something that corners like it’s on rails, so you may decide to hit that corner with a little more spirit. Or, your pride and joy may have enough torque to slightly alter the earth’s rotation. Few things are as beautiful as a ’70 LS6 SS Chevelle with white clouds billowing out from the rear fender wells. It’s better than hours of therapy! 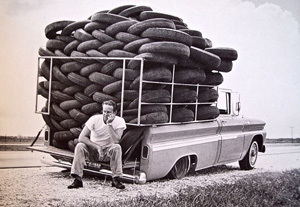 That’s why for tires, the phrase smoke ’em if you’ve got ’em can now be applied to a practice offering many health benefits. Responsibly, of course!